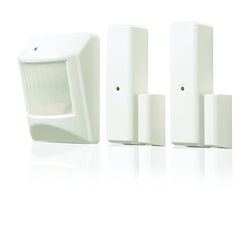 This ZWave sensor bundle includes a Zwave motion sensor and two ZWave door/window sensors that work with Zwave enabled home automation hubs like SmartThings, Vera, Wink, Hometroller, Fibaro and more. When used with an automation hub, these sensors can be used to monitor areas, create alerts and trigger actions such as having lights turn on. Using the automation hub app on your Android or iOS smartphone/tablet, you can easily monitor all activity remotely.